A Super PAC in support of Sen. Mark Begich (D., Alaska) is attacking his Republican opponent for having a home out of Alaska despite the fact that Begich himself owns a home in Washington, D.C.
A recent ad by Put Alaska First PAC says that opponent Dan Sullivan is no Alaskan, pointing to tax records that reveal a million dollar home in Maryland. 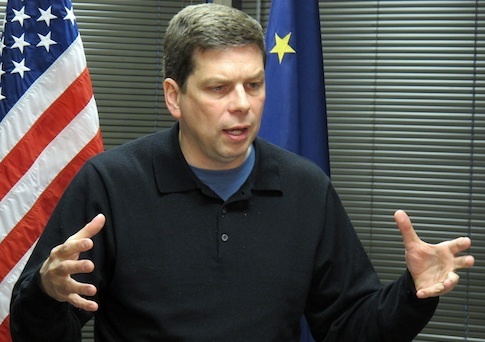 Begich purchased a Capitol Hill home for $849,000 in 2009, the year he was elected senator. The D.C. Office of Tax and Revenue Assessment currently values the home at $960,770 and expects its value to exceed $1 million in 2015. Begich also lists his D.C. address on the property records for his home in Anchorage, Alaska, which is currently valued at $393,200. Sullivan, a U.S. Marine, moved to Alaska in 1997 after serving several years in the Marine’s Anchorage-based Echo Company, known as the "Marine Corps Reserve’s premier cold weather reconnaissance unit." He moved to the Washington, D.C., area during the George W. Bush administration to work on both the National Economic Council and the National Security Council for the White House. He was then appointed to be U.S. assistant secretary of state for economic, energy, and business affairs, where he served as a top adviser to Secretary of State Condoleezza Rice until January 2009. Sullivan returned to Alaska where he became the state’s attorney general, and later became commissioner of the Alaska department of natural resources.